A bombshell-set of interim results during April had already admitted these full-year results would not be great. In the end, annual revenue dropped 9% and operating profit collapsed 53% as WOR collected lower fees from a major customer and lifted expenditure on system development, product marketing and overseas expansion. New contracts involving “a number of large-scale client projects” helped the H2 top-line advance on H1, and match the H2 top-line of the previous year. H2 profit was well ahead of H1 profit, too. These investments are being made to “provide a sound basis for the long-term future of the business”. Just how large the annual cost base will become is hard to say, but doubling up the expenses recorded during H2 suggests at least £7m. That does not leave much room for profit if revenue stays at £7.9m. Sure enough, profit for 2010 fell a further 16% to £557k… but four years later had more than quadrupled to £2.4m. Clearly the investments made back in 2009 paid off handsomely. All told, I will gladly take another year of greater development costs… if the end result is another quadrupling of profit! WOR’s accounts remain very conservative. All development expenditure is charged through the income statement while the balance sheet continues to carry plenty of cash and no debt. The latest £8.2m cash position is equivalent to 109p per share — or about half the current 220p offer price. I have to say, I do wonder if some of that cash could be used to enhance the stingy annual dividend — which has been stuck at 3.5p per share since 2006. With current-year costs set to rise and perhaps knock profit even lower, it is difficult to judge WOR’s immediate valuation. Using the 2015 figures, an operating profit of £1.1m after standard 20% UK tax gives earnings of £923k or 12.2p per share. With the 220p offer price giving a market cap of £16.6m, I reckon WOR’s enterprise value (EV) is 111p per share, or £8.4m. The P/E on my EV and EPS calculations is therefore 111p/12.2p = 9. That valuation does not look expensive, but I originally bought on a supposed cash-adjusted P/E of 8 — only to now find myself 50% down on my investment :-( That suggests a greater margin of safety is required before I consider buying again! * Next events: Ex-div on 19 November, AGM on 14 December, 3.5p final dividend paid on 16 December. Just a footnote on WOR’s investment plans. It features Thomas Russo, a successful US fund manager who likes to invest in companies with dominant family shareholders. Why? Because such companies are able to operate for the long term and have the “capacity to suffer” — that is, the families can live with short-term expenditure P&L pain in return for longer-term investment gain. Mr Russo cites various European companies as examples. I just wonder if the dominant (72%) owner at WOR, chairman Charles Hipps, has the same long-term “capacity to suffer” attitude. If so, it ought to bode well for the business. Certainly past annual reports have regularly mentioned ongoing product development and the 2009 example I cited above suggests profits could eventually rebound significantly. Interesting video and his views chime with my own regarding companies investing over a longer time frame rather than ‘hollowing out the business’ to meet short term EPS targets. Has made me reconsider my views on companies with dual class share structures if the aim is to preserve the long term planning within a company. Dewhurst is a company I own and I know you’ve looked at that perhaps fits the bill as an example. Thanks for the note. Yes, Dewhurst is a good example — although the economics of that particular business are not as good as others. 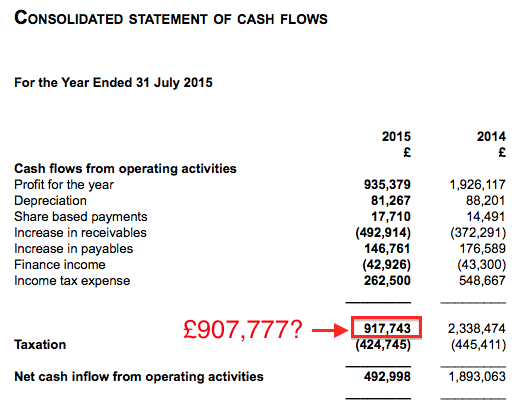 Oh dear — a £9,966 miscalculation in the cash flow statement. WOR was one of a handful of shares still using UK GAAP despite IFRS being introduced about 10 years ago. While AIM rules allow companies without subsidiaries to prepare their accounts using UK GAAP, WOR created a new US subsidiary during the second half and so now has to use IFRS. The change has not created any restatements, and we can determine the profitability of the US subsidiary by subtracting the profit recorded within the top-level company (the UK business) from the profit recorded within the group accounts (the UK business + the US subsidiary). …so giving us £10k for the new US subsidiary. It’s not clear if all of that US revenue was accounted for in the new US subsidiary. I suspect not. Nonetheless, I now wonder whether WOR has gained a decent foothold in the States. 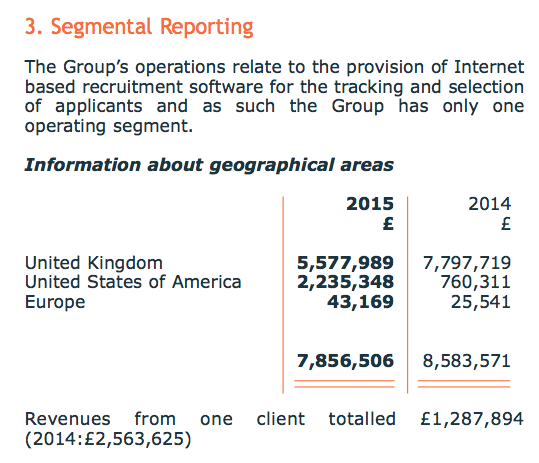 The group received its first US revenue in 2010 and, prior to 2015, such income was c£800k a year. I see the US progress offset a substantial £2,220k loss of revenue in the UK. Some of that loss occurred when WOR’s largest client renegotiated its fees lower. You can see from the footnote that this renegotiation lost WOR £1,276k of revenue. But a further £944k or so was also lost from the UK — presumably in part relating to the third-party online tests referred to at the interim stage. Anyway, the major client had represented 30% of revenue during 2014 and represented 16% during 2015. I believe the switch to IFRS accounting now means WOR has to disclose the amount of revenue from any 10%-plus client, whereas UK GAAP never had such a requirement. It is also worth noting that revenue excluding the major client gained £549k (9%) to £6,569k. At least the chairman/chief executive looks to have received a lower bonus last year. Total staff went from 89 to 98 and each employee receives about £50k a year — in line with 2012, 2013 and 2014. The total option count represents 4.7% of the year-end share count. Also, the age of the owed receivables has increased. The year-end receivable figure represented 115 days of revenue for 2015, the highest ever for WOR and compares to an average of 80 for the previous four years. My reading of the H1/H2 splits suggests WOR may have received some new contracts towards the end of the financial year, which have been booked as profit but the cash had yet to be collected by year-end. Given the group’s cash-generation track record, I am not too worried about these numbers just yet. But I will keep an eye on developments. I’ve been digging for more information about WOR’s largest contract, which the company revealed within its results this year had been renegotiated lower. I asked management at the group’s AGM on December 14th who the client was and why it decided to pay a lower fee. I was not told the identity of the client, but I was told of “pricing pressures” and the importance of “saving money” to this client. Apparently the tender for this revised contract specified that cost would represent 50% of the decision weighting. Anyway, after a bit of searching I have discovered the major client is HMRC. The contract was for four years starting 30 January 2014. So, there were three rival tenders and the contract has an estimated total value of £2.12m. D7.1	Without prejudice to the Client’s obligations under the FOIA, neither Party shall make any press announcement or publicise the Contract or any part thereof in any way, except with the written consent of the other Party, which shall not be unreasonably withheld or delayed. D7.2	Both Parties shall take all reasonable steps to ensure that their servants, employees, agents, sub-contractors, suppliers, professional advisors and consultants comply with Clause D7.1. D7.3	The Contractor shall not use Client or Customer Organisation’s name or brand in any promotion or marketing or announcement without the prior written consent of the Client. E1.1	The system must provide service availability of 99.5% within core hours (Monday – Friday 07:00-19:00) and at a minimum of 99.0% outside core hours. E1.2	A supported service for CS Resourcing and its Customers must be available between 07.00 to 19.00 Monday to Friday and an unsupported service for the remainder of the time. E1.9	Website response time – 1 second – see note 2. Sadly the redacted parts of the contract relate to HMRC’s payments to WOR. 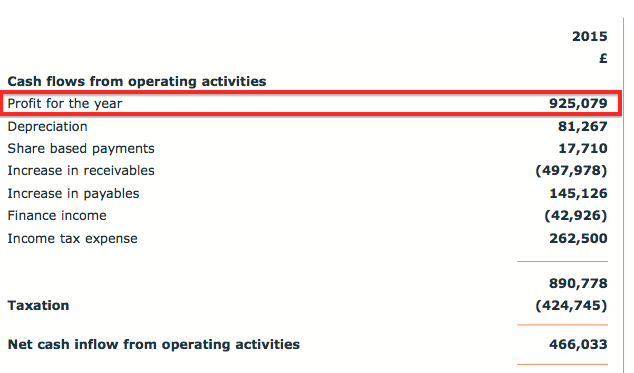 …where the department’s monthly expenditure (above £25k) is disclosed. It is all wonderful stuff. In fact, you can see from the October 2015 data that WOR received £56,016.00 on 7/10/15 as its monthly charge for its e-recruitment system, and £29,791.56 on 14/10/15 for supplying online tests. Anyway, I have been through every set of monthly data and discovered since July 2011 (the first month that showed WOR as an HMRC supplier), that HMRC has paid WOR a grand total of £8,553,540.27 including VAT. Excluding VAT, the sum comes to about £7,127,950. For the five years to July 2015, HMRC paid WOR £8,299,684.71 inc VAT. That comes to £6,916,403.93 exc VAT. In comparison, WOR’s revenue during the same five-year period was £36,194,165. As such, HMRC represented 19% of WOR’s total revenue during that time. Here are the same sums but excluding the year to July 2011, during which WOR received only minor payments from HMRC. 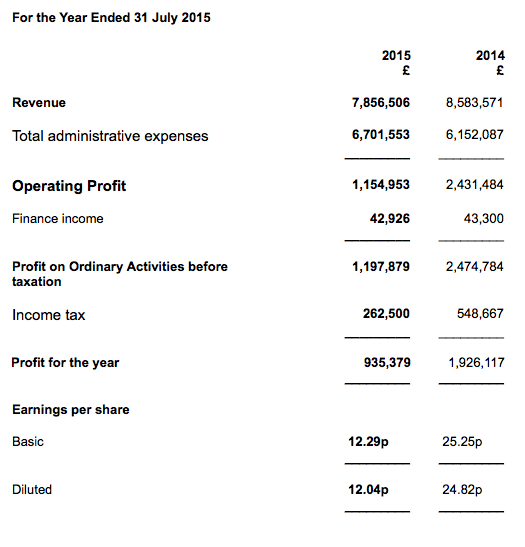 So for the four years to July 2015, HMRC paid WOR £8,136,677.75 inc VAT. That comes to £6,780,564.79 exc VAT. In comparison, WOR’s revenue during the same four-year period was £30,842,725. As such, HMRC represented 22% of WOR’s total revenue during that time. 1) The financial-year payment figures above do not match the largest client revenue figures disclosed within WOR’s 2015 annual report, because the latter figures are compiled on an accrued accounting basis. 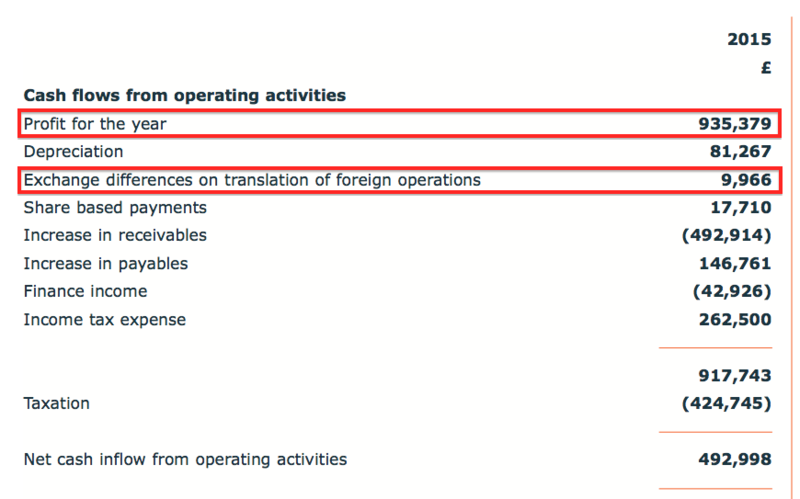 Indeed, looking through HMRC’s transparency data, it is clear HMRC can be tardy paying its bills. For example, I notice charges covering April 2015 were paid in September 2015. Some payments cover multiple months, too, which are spread across financial years. I mentioned in a comment above that WOR’s trade receivables had increased for 2015 and HMRC’s payment data goes a long way to understanding why! 2) WOR’s revised contract with HMRC was implemented in late January 2014 and the payment data from around that time discloses just how much less WOR is now receiving. Back in February 2014, WOR received £137,279.35 and £26,516.10 as monthly service charges for maintaining the Civil Service recruitment websites via HMRC. By April 2014, however, those two monthly payments had been replaced by a single monthly payment of £56,016.00. So it seems to me WOR has seen its monthly contract income from HMRC drop a massive 66%. 3) WOR’s revenue from HMRC during the financial year to July 2014 was bolstered by several one-off jobs as well as the supply of online recruitment tests. So the effect of the renegotiated price was not so obvious back then. Moving into the financial year to July 2015, and a lower number of one-off jobs plus the lower monthly fee hurt revenue as WOR’s results duly admitted. But moving now into the current financial year to July 2016, there has been only one one-off job so far declared by HMRC. This trend suggests WOR will be relying much more on its monthly service charge from here-on-in with HMRC. Just so you know, WOR’s monthly £56,016 charge equates to £560k a year exc VAT — more than 50% lower than the £1,288k the group declared it received from HMRC during FY2015. So the immediate outlook to WOR’s top line from HMRC at least is not great. Still, I shall keep track of HMRC’s monthly transparency data to see if WOR does pick up some extra work. Maynard – great investigative analysis – thank you! I notice that the free float i tiny – about 4.5% (i.e. about £500k) – and the company is buying up shares. It bought almost £200k of shares last year; if it keeps this up it will have taken itself private within a couple of years. This makes it very tricky to exit one’s investment, no? Thanks for the comment. Yes, the free float is tiny and the shares are extremely illiquid, but I think it is a decent company. An exit will be tricky, but I am hopeful the company’s (positive) progress over time will attract more investors and therefore improve liquidity, although I may be in for a longer wait than I had anticipated at the time of my purchases. Oh well. The controlling shareholder will at some point look for an exit, too, and he may sell out one day. I attended the AGM last month and the board confirmed that the company undertakes buybacks only when somebody offers them shares to buy. So the execs are not looking actively to repurchase shares. I suppose an exit could be selling my shares to the company direct. Just so you know, I increased my WOR shareholding by 65% during January at an average price of 179p including all costs. Using the trailing 12.2p EPS calculation mentioned in the Blog post above, I reckon 179p valued WOR at less than 6x earnings adjusted for the company’s cash resources. So…why buy more of this illiquid, obscure share? Well, I have probably been reading MicroCapClub.com and articles such as this too much! Still, WOR does offer many attractions: a long-time founder chief exec, cash-rich and cash-generative books, a very respectable customer base and a general track record of growth (albeit with the occasional setback). Plus, I do get the impression WOR’s boss is happy to re-invest the firm’s profits for the longer term at the expense of near-term earnings. That seems a sensible approach to me, and as I noted in the Blog post above, profit fell in 2009 and 2010 as product development costs increased… but then advanced multi-fold by 2014 as the firm reaped the benefits. I’m hoping the current bout of heavy re-investment will result in a similar payoff. For instance, if EPS drops to 10p for 2016, then recovers to 12p, 15p, 20p and 25p (its 2014 peak) between now and 2020, then I reckon WOR would provide shareholders with about 80p per share of extra cash (c18p total paid as a dividend and c61p retained on the books) during those five years. The cash pile in 2020 would then be today’s 109p + my projected 61p = 170p per share — just about enough to cover my recent purchase price. A bid price of 360p in 2020 would represent that 170p per share cash-pile projection plus 190p per share for the value of the underlying business — i.e 190p/my 25p EPS projection = an underlying P/E of 7.6. That potential future rating does not seem outlandish. A bid price of 360p in 2020 would equate to doubling my money in 5 years, which would give a healthy annual compound return if my predictions prove accurate (and the possible return could be higher if I include those 18p per share of dividends). In the meantime, I’d like to think the 109p per share cash pile protects some of the downside from here. I continue to monitor the monthly expenditure updates from HMRC (what was WOR’s largest customer). I mentioned in a Comment above that HMRC had paid WOR £253,855.56 (inc VAT) so far for the year ending July 2016. With HMRC’s data now extending to January 2016, I make the total payment to be £651,176.76 (inc VAT). The monthly £56,016 payments have been supplemented by £115k received for the provision of online tests and £113k for ‘IT enhancement work’. On an accrued/accounting revenue basis, I make the total for the first six months of the financial year (July 2016) to date to be £539,144.76, or about £431k ex-VAT. That compares to £1,287k of revenue from HRMC during the year to July 2015. So I believe the run-rate of HMRC revenue is currently about a third lower than last year. I mentioned in the Comment above that HMRC had paid WOR £651,176.76 (inc VAT) so far for the year ending July 2016. I make the total payment to be £707,192.76 (inc VAT) for the year to July 2016 after a further £56,016 was paid to WOR in February. On an accrued/accounting revenue basis, I make the total for the first seven months of the financial year (July 2016) to date to be £595,160.76, or about £496k ex-VAT.